Peafowl is the common name for members of two species of large birds of the pheasant family Phasianidae, Pavo cristatus (Indian peafowl) and Pavo muticus (green peafowl), characterized by crested heads, long legs, heavy wings, and resplendent blue or green plumage, as well as males having long, brilliant, back feathers (upper tail coverts) that can be erected and fanned out and have iridescent, eye-like spots. While technically the male is a peacock and the female a peahen, the term peacock often is used for the both the males and the females or the female may be referred to as a "female peacock." The term peafowl also is used for another member of the family in another genus, the African Congo peafowl, Afropavo congensis, but this article will be limited to the two members of the Pavo genus. 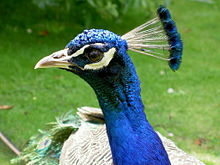 Peafowl are best known for the male's extravagant "tail" which is displayed as part of courtship. While this feature advanced the peafowl's individual function of reproduction, it has also made the peafowl a well-known ornamental bird, bring delight to people. Ecologically, they provide a role as part of terrestrial food chains, consuming various invertebrates, small vertebrates, and plant matter, and being consumed by larger animals and predatory birds. In particular, the chicks and peahens are at risk when they nest on the ground but as adults their roosting in trees offers greater protection. Peafowl are members of the Galliformes family Phasianidae, which also includes the pheasants, quail, partridges, and junglefowl. These are terrestrial species, variable in size, but generally are plump, with broad relatively short wings. Many have a spur on their legs. Males of the larger species often are brightly colored. Indian peafowl, Pavo cristatus (Asiatic), also known as common peafowl or blue peafowl. The Indian peafowl is a resident breeder in the Indian subcontinent. 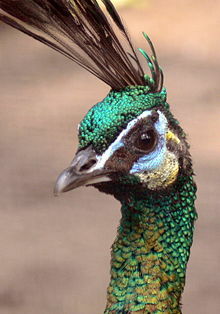 The green peafowl breeds from Burma east to Java. The IUCN lists the green peafowl as vulnerable to extinction due to hunting and a reduction in extent and quality of habitat. These two species are spectacularly plumaged birds and are the largest members of the Phasianidae. Males and females of both species have a crest atop the head. The males of both species have highly elongated and elaborated "trains" or "tails," which are decorated with metallic ocelli. While commonly called tails, these are actually the uppertail covert feathers, while the peacock's tail is much shorter and stiff and helps to prop up the train during display. Covert feathers, as the name implies, cover other feathers, with the uppertail coverts covering above the base of the tail feathers. The peafowl are forest birds. They are terrestrial feeders and nest on the ground to raise their young, but they can fly and they roost in trees. During mating season they will often emit a very loud high pitched cry. Peafowl are omnivorous and eat ticks, termites, ants, locusts, mice, plant parts, flower petals, seed heads, scorpions, other arthropods, reptiles, and amphibians. The male (peacock) Indian peafowl has iridescent blue-green or green colored plumage. The so-called "tail" of the peacock, also termed the "train," consists of highly elongated upper tail coverts. The train feathers have a series of eyes that are best seen when the train is fanned. 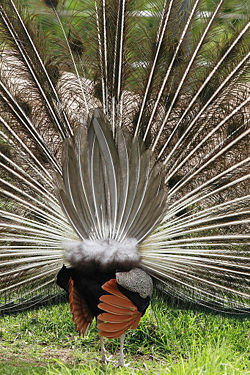 The actual tail feathers are short and gray-colored and can be seen from behind when a peacock's train is fanned in a courtship display. During the molting season, the males shed their stunning train feathers and reveal the unassuming gray-colored tail that is normally hidden from view beneath the train. The female (peahen) Indian peafowl has a mixture of dull green, brown, and gray in her plumage. She lacks the long upper tail coverts of the male but has a crest. The female can also display her plumage to ward off female competition or danger to her young. The green peafowl is very different in appearance to the Indian peafowl. The male has green and gold plumage and has an erect crest. The wings are black with a sheen of blue. Unlike the Indian peafowl, the green peahen is very similar to the male, only having shorter upper tail coverts and slightly less iridescent in some regions. Like other peafowl, it is very difficult to distinguish a juvenile male from an adult female. Moreover, the sexes of the various green peafowl species are almost impossible to tell apart in the field during the months when the male has no train. Many of the brilliant colors of the peacock plumage are due to an optical interference phenomenon (Bragg reflection) based on (nearly) periodic nanostructures found in the barbules (fiber-like components) of the feathers. Different colors correspond to different length scales of the periodic structures. For brown feathers, a mixture of red and blue is required: one color is created by the periodic structure, and the other is a created by a Fabry-Perot interference peak from reflections off the outermost and innermost boundaries of the periodic structure. Such interference-based structural color is especially important in producing the peacock's iridescent hues (which shimmer and change with viewing angle), since interference effects depend upon the angle of light, unlike chemical pigments. A rear view of an Indian blue peacock's tail feathers. Asiatic peafowl occupy a similar niche as the roadrunners, Secretary Bird, and seriemas. All of these birds hunt for small animals including arthropods on the ground and tall grass and minnows in shallow streams. Because of human encroachment into their natural territories, peafowl and humans have come into increasing contact. Because of their natural beauty some are reluctant to classify the birds as pests; however, their presence can be disturbing, especially given their tendency to eat indiscriminately of garden boundaries and the male's powerful vocal crow (louder than a rooster's crow). Peafowl have left captivity and developed permanent, free-roaming populations in several parts of the world including Coconut Grove, Miami, Florida, and Arcadia, California. 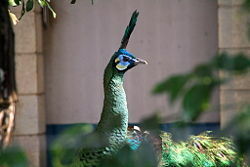 The Indian peafowl is monotypic, while the green peafowl has three described subspecies, P. muticus spicifer, P. m. imperator, and the nominate P. m. muticus (Madge and McGowan 2002). The two species are largely allopatric but will hybridize in captivity. The Indian peafowl, Pavo cristatus, also known as the common peafowl or the blue peafowl, is the largest Asian galliform. It is found in the Indian subcontinent and has been introduced into many parts of the world and feral populations exist in many introduced regions. The species is found in dry semi-desert grasslands, scrub, and deciduous forests. It forages and nests on the ground but roosts on top of trees. It eats seeds, insects, fruits, small mammals, and reptiles. Females are about 86 centimeters (34 inches) long and weigh 2.75 to 4 kilograms (6-8.8 lbs), while males average at about 2.12 meters (7.3 feet) in full breeding plumage (107 cm/42 in when not) and weigh 4-6 kilograms (8.8-13.2 lbs). The Indian peacock has iridescent blue-green plumage. The upper tail coverts on its back are elongated and ornate with an eye at the end of each feather. These are the peacock's display feathers. The female plumage is a mixture of dull green, gray, and iridescent blue, with the greenish-gray predominating. In the breeding season, females stand apart by lacking the long "tail feathers" or "train," and in the non-breeding season they can be distinguished from males by the green color of the neck as opposed to the blue on the males. A white peacock domesticated in Mexico. Blau, S. K. 2004. 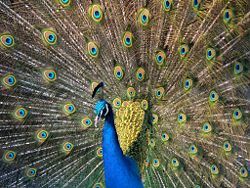 Light as a feather: Structural elements give peacock plumes their color. Physics Today 57(1): 18–20. Retrieved October 28, 2008. Dyke, G. J., B. E. Gulas, and T. M. Crowe. 2003. Suprageneric relationships of galliform birds (Aves, Galliformes): A cladistic analysis of morphological characters. Zoological Journal of the Linnean Society 137(2): 227-244. Retrieved October 28, 2008. Kimball, R. T., E. L. Braun, and J. D. Ligon. 1997. Resolution of the phylogenetic position of the Congo peafowl, Afropavo congensis: A biogeographic and evolutionary enigma. Proceedings: Biological Sciences 264(1387): 1517-1523. Loyau, A., M. Saint Jalme, and C. Cagniant. 2005. 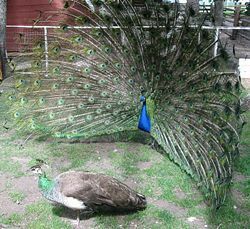 Multiple sexual advertisements honestly reflect health status in peacocks (Pavo cristatus). Behavioral Ecology and Sociobiology 58(6): 552-557. Madge, S., P. J. K. McGowan, and G. M. Kirwan. 2002. Pheasants, Partridges and Grouse. London: Christopher Helm. ISBN 0713639660.
van Balen, S., D. M. Prawiradilaga, and M. Indrawan. 1995. The distribution and status of green peafowl in Java. Biol. Conserv. 71: 289-297. This page was last modified on 21 November 2008, at 17:42.